When conditions turned ugly on Friday and Saturday at Louisville Nationals, Jake Wells was nothing short of a star, especially when he had to get off his bike and run. Looking back, it turns out Wells had a big advantage. “As I was preparing for Cyclocross Nats in Louisville, I knew I was in for Land Run double and needed to be getting in some runs, but because ’cross is such a short and more explosive effort, I didn’t want to do a lot of long, slow runs just yet. A long run for me was six or seven miles, and I was doing one of those per week,” Wells said. 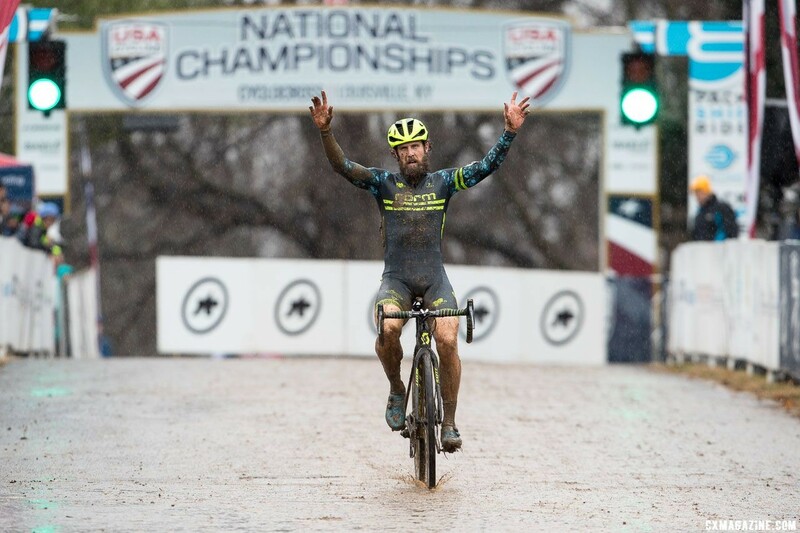 Knowing that he was training for the Land Run double—a 50k run on Friday and the 100-mile ride on Saturday—Wells won the Masters 40-44 and Singlespeed titles in Louisville for the second time in 2018. Wells eventually upped his running volume and headed to Stillwater earlier this month for the two-day mixed-discipline race. Wells finished 3rd in Friday’s run behind Jason Smith and Cody Jones, but on Saturday back on the bike, he finished tops among the double competitors and 10th overall. We chatted with Wells about the experience of training for two long-distance races back-to-back, and of course, we took a look at his running gravel gear. Cyclocross Magazine: Where did the motivation to do the Run / Bike double come from? 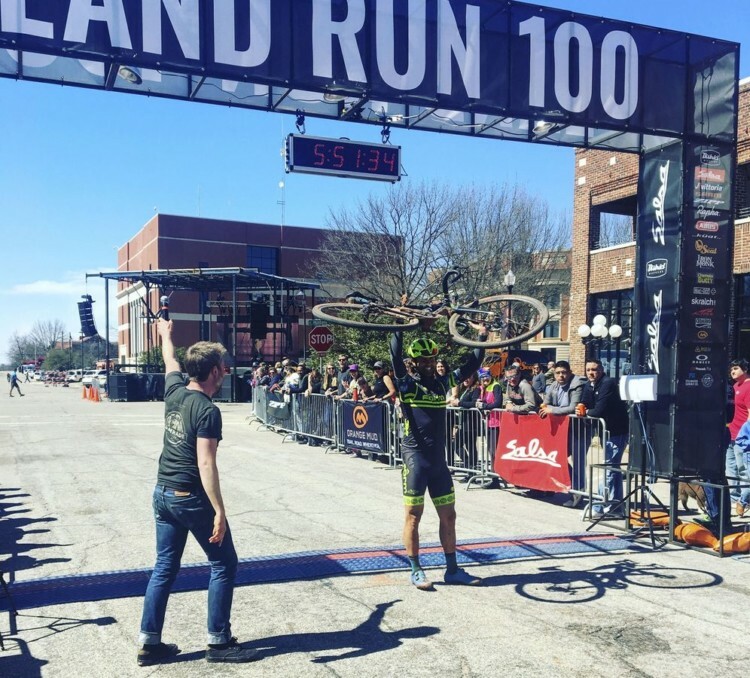 Jake Wells: I’ve been familiar with the Land Run 100 for the last couple of years, and it has been on my list of events that looked really cool and wanted to check out. For this season, I decided that I wanted to do some events that really challenged me and pushed my comfort level more so than just being competitive. Last year I raced Belgian Waffle Ride, Dirty Kanza and Gravel Worlds, so I was confident in my ability to complete the Land Run, and if I could get my training correct, I felt like I could be competitive. CXM: You crushed the running at Louisville Nats, is that something that is regularly part of your training? JW: Yes, typically. I have played with different levels of running when it comes to preparing for ’cross. Everything from no running at all to logging 12 to 15 miles per week. As I was preparing for Cyclocross Nats in Louisville, I knew I was in for Land Run double and needed to be getting in some runs, but because ’cross is such a short and more explosive effort, I didn’t want to do a lot of long, slow runs just yet. A long run for me was six or seven miles, and I was doing one of those per week, but I would do two or three-mile runs a couple of times per week, and I would do those runs pretty fast. Like a seven-minute pace or quicker. I feel like this actually helped with my legs making the adjustment to the impact of running and it gave the connective tissue in my joints time to catch up to my leg strength. I think the fact that I had CX Nats looming forced me to keep the volume of my runs a little light with was a blessing in the end. It obviously paid off at Nationals. CXM: How did you mix running and biking in your training? Did you look toward triathlon training at all? JW: I didn’t look at any tri training, but I felt that if I could get my running efficiency up and maintain a respectable pace for the run, I could make up for a bit of deficit when I was on the bike. CXM: How did the run go? JW: The run went really well. It was a big question mark for me because I had never run that far. My biggest training run leading up to the event was 23 miles, and I hadn’t raced anything longer than a 10k in over 15 years or so. Cody [Jones] and Jason [Smith] were pretty much gone from the gun. I got occasional time checks, but I tried not to worry too much about them and their pace. I had a goal of 4 hours for the 50k but it was pretty windy, so I decided to settle into a group of 5 early on. Our pace was good, and I was able to sit in some and do what I could to conserve. It looked like we were going to get a nice tailwind around Mile 14 and at that point, I was still feeling good, so I let the choke out a little. I did like five miles there in the middle at sub-seven-minute pace. I think I probably paid for that effort over the last few miles. The lesson learned is that pacing for an Ultra is even more important than when on the bike. In the end, I finished 3rd and I ran 3 hours and 47 minutes, 3 minutes under my goal time, but I had an 18-minute deficit to Cody, last year’s winner, and was almost 23 minutes behind Jason, who was an unknown at that time. CXM: Since we always ask about bikes, what shoes did you wear? Any special gravel mods? JW: I’ve been training in the New Balance Summit Unknown shoes. They are a pretty minimal shoe, but a legit trail runner with a rock plate underfoot. I was happy with the shoes in my training, so no last minute changes. The big unknown for me was nutrition and how much could my stomach handle over the four hours. I finished feeling pretty good energy level wise, but my legs were pretty locked up. Mostly my calves and hamstrings. CXM: How was it Day 2 getting on the bike? Any regrets on Saturday morning? JW: Similar to a stage race, I knew recovery was going to be a big factor. In my training, I was used to getting on the bike the day after my long run, so I was confident that my legs would come around on the bike, but I had never run this far. As soon as I finished the run, I got some food and took a nap. I tried to stretch out the legs as much as I could. In the evening, I decided to take an easy spin over to the racers’ meeting, about one mile from our condo. That actually felt pretty good on the legs. But I wasn’t sure how the body would respond the next day and if I would have the responsiveness to make the lead group on the bike or not. CXM: Looks like you had some time to make up in the ride? How did that affect your approach? JW: My goal on the bike was to try to get toward the front and hopefully make the lead group or at least be in the first chase group. I was kind of surprised at how well the legs felt, and with every mile we ticked off, I was gaining confidence that I was going to be able to maintain contact with the front of the race. The top 3 guys, Payson, Teddy, and Drew got away with about 35 miles to go after a bottleneck section that required a dismount and some savvy mud clearing tactics. But I was able to get in with a couple of guys and we worked together to minimize the time lost. We pretty much stayed together until 12 miles to go and then things splintered up a little. I ended up coming in with one other guy and we were about four minutes off the leaders. Then it was just a waiting game. I needed to make up just over 23 minutes, and I was just watching the clock. Once that 23-minute mark came and went I was able to start to celebrate a little. Jason came in a little more than 30 minutes after me. CXM: It looks like you finished top 10 in the ride? You wish you just smashed on Saturday after that result? JW: I was super happy with how the ride went. It’s hard to say, those guys at the front were riding super strong, so I don’t really know what would have been different if I hadn’t done the run the day before, but I was really happy with the result. Really tired, but really happy. CXM: What advice do you have for folks looking to do the double next year? JW: We had a great snow year here in Colorado, which meant that it wasn’t so great for getting out on the bike, but I was able to get out for some great long runs and some uphill ski tours. To me, running was the most challenging element to this event so it all worked in harmony. So, my advice for folks would be to sign up and do it. You just might surprise yourself. We are all looking for our own personal adventure and challenge. That’s why we do these events. Get a training plan that works with your schedule and do the best you can to prepare, but in the end, if it is something that scares you a little and you want to retract from it, don’t. Instead, lean into it and embrace the challenge. CXM: It seems like you’ve been enjoying your “post-retirement” gravel/Masters cyclocross/ultrarunning. What about this approach has been so appealing for you? JW: Yes, I’m definitely enjoying the way things are going right now. I think the key to it all is balance and motivation. Like I’ve said, I’m finding joy in jumping into these events that are not my typical type of events, ether running events or ultra long days on the bike. To me, it’s an avenue to inspire and motivate others. I used to think that I was only able to do that if I was at the front of every race I entered, but now I realize that I can achieve that even in my weekly training routine or by following my nutrition program or by being consistent with recovery or mediation practice. It’s well beyond a result. For me, that takes away some pressure and allows me to follow my passion and my heart and continue to find joy in whatever I’m doing. CXM: Awesome. Thanks. Looking forward to seeing what adventure is next.